While Marcos was on vacation, Damon was interviewing Aaron Draper at the Governor's Ball in NYC at Randall's Island. For a complete recap of the last day of the festival's events, click HERE. Our guest this episode is Kahlil Cummings. Kahlil is a Los Angeles native, an acclaimed drummer, exceptional performer, composer, and educator. Kahlil was recognized as a child prodigy very early; since childhood, he has played with numerous reputable groups including Ballet Folclórico Do Brasil, Sona Sané, Abalayé, Mila Samba School, Inu Olorun, Debbie Allen Dance Company, Les Amazones, and Viver Brasil. Kahlil honed his rhythmic gifts with noted teachers including Mestre Amen Santo, Jose Ricardo Sousa, Kobla Ladzekpo, Esteban “Cha Cha” Bacallao (Ibae), and Sandy Perez. His studies in Guinea, Brazil and Cuba have helped to widely broaden his knowledge and musical strength. However, he is most profoundly influenced by West African master drummer Mamady Keita, with whom he has studied since the age of 13. Kahlil helped start the group Balandugu Kan, which was sanctioned by Keita as representing “the voice of Balandugu”--- the village where Keita was born. His compositions can be heard on his debut album Iniké Baba, recorded live in Guinea, West Africa. First up is Kosa 23. That is Kosa Music's 23rd annual hands on intensive workshop with world renowned faculty from June 25th-30th in Montreal Canada. You can REGISTER NOW for a spot! Scott Kettner (friend of the show, Episode #9) has his Carnival Caravan Summer Retreat from July 27-29th 2018 in Philadelphia, PA. There are still spots available if you click this link HERE! This seminar will not only show you how to get "the gig", but also how to keep it. In addition, showing how versatility with not only your playing, but other revenue streams to keep you employed off the road as well as throughout your career. The business side of music will be explained as it pertains to a self employed musician and how to navigate some of the challenges faced. We talk about Vickory Sticks by Clément Desplats. The project has already been funded, but they are awesome sticks and you can still preorder your pair! NOTE: They are located in France so you have to pay in Euros and allow for ship time. First bit of news, what is the GDPR and why are you getting notifications and emails? Next, Apple Music’s Web Player Now Streams Entire Songs – No iTunes Needed. Moving right along, here's a list of 5 of the best music documentaries on the planet (their words, not mine). Lastly, Recording Academy President, Neil Portnow is stepping down amid multiple controversies. 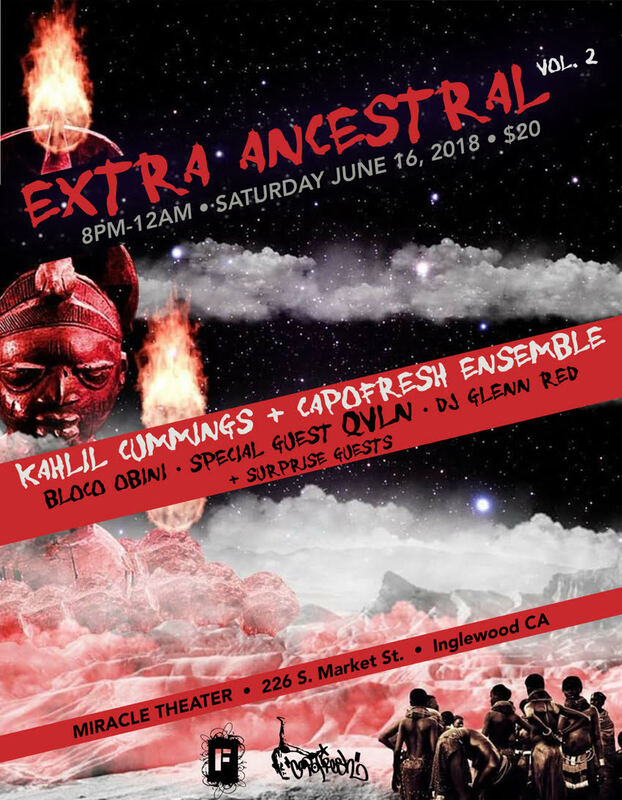 The track leading into the album is called "Extra-Ancestral" from Kahlil's album. (Marcos joins the interview a little later, as he was finishing a session). Kahlil is not only a percussionist, but he is also a capoeirista. Kahlil went to Hamilton High School and California Institute for the Arts. Kahlil's instructor for marching band marched the Blue Devils. If you are interested in that or other drum corps near your area, you can check out DCI dot org for the Drum Corps International website. Damon and Kahlil talk about the 4 stages of learning, created by Noel Burch in the 1970s. Kahlil was fortunate enough to study with the djembefola legend Mamady Keita. If you are interested in the instructional DVDs that Mamady recorded, you can click this link HERE. The two choreographers that Kahlil mentions are Jefferey Page and Fatima Robinson. This is an example of Krumping which is a hip hop style of dancing. This was the opening to the NAACP Image Awards that Kahlil mentions. This is a little behind the scenes look at Pharrell's performance of Happy at the Grammys and this is Kendrick Lamar's performance the following year. Stay tuned for "Heaven and Earth" by Kamasi Washington due out June 22nd. If you're interested in capoeira in the Los Angeles area, the group Kahlil mentions (that has also brought him to Japan) is called Capoeira Batuque. Kahlil uses Latin Percussion instruments, Istanbul Mehmet Cymbals, & Remo Drumheads. He is managed by the Silas White Group. You can follow Kahlil on his Website, Facebook (Music), Facebook (Personal), Twitter, & Instagram. Special shoutout to Viver Brasil (check out Samba in the Streets)!! !